Walt Disney's First Full Length Feature Production! Pursued by a jealous queen, Snow White hides with the Dwarfs, but the queen learns of this and prepares to feed her a poison apple. Most of us never knew a world without Disney animated feature films. Walt unleashed the very first one in 1937 with Snow White and the Seven Dwarfs, and this started a brand-new genre. Since not too many of us were around in 1937 – much less old enough to be cognizant of movies - this means very few folks remember a cinematic landscape without such films. As such, it feels very difficult to comprehend what a gamble Snow White was. Mockingly referred to as “Disney’s folly” at the time, many saw this expensive project as the probable downfall of the Walt’s studio. The standard viewpoint thought that while people would enjoy cartoons for seven or so minutes at a time, there was no way anyone could sit still for a feature-length program. Disney upped the ante further with the nature of Snow White. Rather than just create a series of nonstop laughs, this flick went with a more subtle approach and actually tried to offer a warm, emotional experience. 79 years after the fact, this seems like no big deal. We’re used to animated films that run the gamut of attitudes, and it doesn’t appear odd to feel moved by a cartoon. Back then, however, the concept sounded absolutely ludicrous. Would people be willing to suspend disbelief for the whole 83 minutes and actually care about drawings projected at 24 frames a second? It didn’t seem possible, much less probable. But Disney proved all of the nay-sayers wrong. Not only did Snow White fail to kill the studio, but also it provided an astonishingly rich and compelling experience that cleaned up at the box office. Single-handedly, Snow White created an entirely new art form that only grows in importance and stature with every passing year. In Snow White, we find a simple story. The existence of a princess named Snow White (voiced by Adriana Caselotti) threatens the vanity of her stepmother, the Queen (Lucille LaVerne). According to the Spirit of the Magic Mirror (Moroni Olsen), Snow’s more beautiful, and Queenie can’t stand to have any competition in this area. As such, she sends a huntsman (Stuart Buchanan) to kill Snow. However, he can’t bring himself to slay her, so fakes it and simply warns Snow to go into hiding. While lost in a spooky forest, Snow eventually happens upon a quaint little cottage which she soon learns is occupied by seven tiny dudes, the titular dwarfs. They quickly grow to love her as they all become one happy family. We follow their path as well as the Queen’s continued attempts to kill Snow. Yes, it’s a threadbare story, but Disney makes it work. For one, the pacing keeps the plot moving at a good rate. There are some character moments that leave the overall story for a while - most of which involve interactions between Snow and the dwarfs - but these serve the development of the participants, so they don’t seem extraneous. Although the different roles are left somewhat thin, they nonetheless seem pretty well developed considering how many of them there are and the length of the movie. 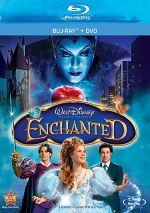 Including Snow, the Queen/Witch, and the dwarfs, the movie offers nine important parts, and we also have the Huntsman and the Prince to consider. Of that bunch, only the latter really falls flat. Snow and the Queen lack depth, as they’re one-note characters, but they still feel reasonably clear and vivid. The dwarfs are really the best of the bunch, though. The amount of personality packed into each of the seven seems stunning given their lack of individual screentime. Nonetheless, we quickly get a good feel for them, and they show nuance and character that exceed what they should have given us. The ability to transform minor characters into fairly full-blooded and compelling characters has always been a Disney hallmark, and that trait seems at its best during Snow White. In addition to the dwarfs, the various woodland animals show lots of personality, and many of them make a strong impression despite no lines and little screentime. Creations such as these add breadth and dimension to the film and make it all the more winning. Although Snow herself feels somewhat bland, the horrific presence of the Queen helps spice up matters considerably. I’ve seen Snow White a few times, but I always forget just how truly nasty this character is. The Queen may well be the most evil personality in the Disney canon. She wants to kill Snow just because some dope in a mirror thinks she’s prettier, and she’ll crush anyone who stands in her way! The scene in which she transforms into the Witch shows just how wacko she is, and it offers a wonderfully scary moment that helps make the Queen one of the all-time great movie villains. For the most part, the animation of Snow White seems very good. The use of realistic human characters caused the studio serious challenges, and these concerns appear from time to time. Some of the movement by these participants seems a bit stiff and awkward on occasion. For example, when Snow falls into bed at the dwarfs’ house, she does so in a jerky manner. Prince Charming gave the animators such fits that his part was cut back considerably from what it was meant to be, and he still appears light and insubstantial. However, most of the animation works very well, especially in regard to the dwarfs. Though humans, they were treated in a more cartoony manner than the taller people, and this allows them to move in a more convincing way; the animators clearly felt more comfortable in this realm at that time, and the added confidence comes through strongly. The animals also show greater fluidity. Despite some minor animation flaws, the artwork found in Snow White consistently looks excellent. The depth and intricacy of the material - especially the gorgeous backgrounds - really seems astonishing, as the work is almost always detailed and vivid. The attention to small factors really helps bring the environment to life and makes Snow White a more engrossing affair. Faults? Prince Charming is one of the weakest characters to be found anywhere in Disney lore. Granted, a lot of Disney heroes are flat ciphers, but the Prince seems like one of the least compelling. He exhibits virtually no presence whatsoever and is a boring dud. Basically he and Snow connect just because the story tells them to do so; there’s no obvious reason for their romance. Aesthetically, I never thought Snow made for much of a babe. The Queen’s definitely sexier, as Snow’s too flat and bland for my liking. Of course, tastes were different back in the Thirties. In any case, I think Snow is the least attractive of all the different Disney heroines, but that’s just me! Otherwise, Snow White and the Seven Dwarfs remains a serious winner. 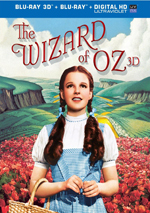 One of only two animated films found on the original American Film Institute's list of the Top 100 movies - along with 1940's Fantasia - Snow White belongs on that chart not just because of its historical significance. Wonderfully drawn and animated with a series of memorable characters and charm to spare, Snow White provides a moving and entertaining experience that hasn't diluted over nearly eight decades. Snow White and the Seven Dwarfs appears in an aspect ratio of 1.33:1 on this Blu-ray Disc. The movie offered excellent visuals. Throughout most of the film, sharpness looked excellent. The majority of the picture presented nicely crisp and detailed images. At times, the image seemed slightly soft, but these instances were rare and the fuzziness remained minor; they didn’t detract significantly from the overall level of quality. I detected no examples of jagged edges or moiré effects, and the presentation seemed to be free from edge enhancement. Snow White also demonstrated a remarkable absence of print flaws. Virtually no defects appeared during this amazingly clean and fresh image. Colors came across as vibrant and bold. As with many animated flicks, Snow White presented a nicely broad palette, and all of the tones looked fantastic. From the purples associated with the Queen to Snow’s blue dress to the caps and garb worn by the dwarfs, the colors remained vivid and solid, with no signs of bleeding, noise, or other concerns. Black levels appeared to be deep and rich, while shadow detail was appropriately heavy but never excessively thick. Admittedly, Snow White wasn’t a totally flawless picture, but it came much closer than a movie of its vintage should, so I thought it deserved its “A+” rating. Indeed, at times the resolution of the Blu-ray image might’ve been too good, as I noticed animation inconsistencies more easily than in the past. When Disney made Snow White, they hadn’t quite gotten human motion right yet, and that showed at times during the film. Occasionally Snow White and the Prince looked a little wobbly. Those inconsistencies existed in all prior versions of the film as well, but they were more noticeable here. I certainly didn’t fault this excellent transfer for that, though. While the film’s DTS-HD MA 7.1 soundtrack wasn’t quite as strong, it still held up nicely for its age. Of course, the audio wasn’t always a multichannel mix; the original track offered monaural sound, which also appeared on the disc. The 7.1 version moderately opened up the soundfield but it didn’t try to reinvent the wheel. For the most part, audio stayed grounded in the center. A few ambient effects spread to the sides, but the majority of the non-central sound came from the music. The score and songs provided a gentle stereo presentation that also swelled mildly to the rears. While the audio definitely filled the forward soundstage and was reinforced by the surrounds, it didn’t show terrific delineation, so the effect seemed a little lackluster. However, I appreciated the fact the remix didn’t attempt to go nuts and create a frantic 7.1 track; the subdued approach was more appropriate, even if I wasn’t wild about the result. Audio quality seemed to be good for its age. Dialogue sounded mildly thin and tinny, and I heard a little edginess along the way. However, most speech appeared quite distinct and clear, and I encountered no problems related to intelligibility. Effects were also a bit flat but they sounded acceptably bright and accurate considering their vintage. The same went for the music. Songs and the score favored the higher registers, but they remained consistently crisp and relatively vivid, and they even added some fairly decent bass along the way. The soundtrack was wonderfully free of the background noise that I expect from Thirties mixes; it seemed clean almost all the time. Although I’m fine with tastefully done 7.1 remixes - of which this was one - I must admit that I favored the monaural track in this case. As my prior comments indicated, I had no complaints about 7.1 version and think it did a nice job of mildly reimaging the sound. However, I felt that the mono edition matched the movie better. No, that doesn’t mean that the 7.1 track suffered from any synch problems. It simply connotes that I found the mono mix to appear more natural in this instance. The additional spread of the 7.1 version appeared somewhat unnatural, as the extra breadth served to remind me that this was an old recording. Like the higher resolution of Blu-ray accentuated animation weaknesses, the additional spread of the multi-channel remix served to remind us of the source material’s weaknesses. On the other hand, the mono mix felt right to me. Unfortunately, it didn’t seem quite as clean as the 7.1 track; I detected a smidgen of noise on a couple of occasions. It also lacked the same level of depth, though I found the bass response to still appear quite good for the era. While I preferred the mono track, in the end this was a “win-win” situation. Those who want the extra breadth will find a good 7.1 mix, while those who favor the original mono audio can listen to it. I’m sticking with the mono, but that shouldn’t be interpreted as a criticism of the nice 7.1 track. How did this 2016 “Signature Edition” Blu-ray compare to the Diamond Blu-ray from 2009? Both seemed identical to me – if any changes occurred between the two, I couldn’t discern them. The “Signature” Blu-ray mixes old and new extras. First up we find an audio commentary. After a quick introduction from former Walt Disney Company Vice Chairman Roy E. Disney, we get a piece that combines new remarks from animation historian John Canemaker and archival recordings of Walt Disney. These occasionally discuss the action onscreen, but for the most part, they remain more general and don’t attempt to provide a “scene-specific” track. Walt Disney covers the roots of the film and talks a lot about the challenges it offered. He also gives us details about the facets of animation required for the project; these don’t always specifically connect to Snow White, but they stay on the correct turf. He even reveals the resentment he once felt toward the film. As for Canemaker, he goes over many production specifics such as the naming of the dwarfs and the problems encountered while animating the Spirit of the Magic Mirror. Canemaker helps put Disney’s statements in the correct frame of reference and makes the piece seem more coherent as a whole. Overall, the commentary offers a nice overview of Snow White and provides an entertaining and compelling experience. In Walt’s Words offers a four-minute, 22-second featurette. This gives us additional archival comments from Walt Disney, as he tells us a little about the movie’s genesis and creation. On their own, the remarks are fine, but they seem a bit redundant after the commentary. We find something unusual under the DisneyView option. This takes the original 1.33:1 presentation and adds visual information on the sides to fill a 16X9 screen. Initially I was skeptical of this option, as I thought it’d essentially attempt to create a widescreen version of the film. Instead, it shoots for a more modest goal. “DisneyView” adds simple artwork to bracket the main action. This might mean royal curtains in the palace or trees in the forest. The visuals are subdued and not particularly intrusive. I don’t “DisneyView” is a killer app, but it’s a nice alternative to the usual black bars on the side of the screen. A new feature, Iconography runs seven minutes, 16 seconds and offers comments from artist Nathan Sawaya, Disney Animation Studios art director Brittney Lee, Professor Sarah Banet-Weiser, “DisneyBound” creator Leslie Kay. They discuss iconic aspects of the film. This turns into a decent but fairly fluffy piece. Another new component, @Disney Animation: Designing Disney’s First Princess lasts five minutes, 16 seconds and features animators Mark Henn and art directors Bill Schwab, Lorelay Bove and Michael Giaimo. They look at various character ideas for the film and give us an appreciation for the work. Though this one can be pretty focused on praise, we get a smattering of useful details. 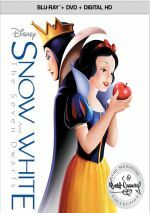 Winner of the longest title for a Blu-ray extra, The Fairest Facts of Them All: 7 Things You May Not Know About Snow White and the Seven Dwarfs fills four minutes, 37 seconds. Indeed, it gives us actor Sofia Carson as she provides seven pieces of trivia related to the film. Fans will probably already know these facts, but Carson’s really hot, so I didn’t mind. With Snow White In 70 Seconds, we get a rapid recap of the film. I expected the 72-second clip to run the whole movie at super-speed, but instead, we get a rap version of the film’s story by some unnamed girl with a dopey haircut. It’s just as awful as it sounds like it’ll be. Next comes an Alternate Sequence. “The Prince Meets Snow White takes us three minutes, 39 seconds and offers a “voice recreation” of a scene that was never completed. It becomes a nice look at a variation on the existing sequence. A documentary called Disney’s First Feature: The Making of Snow White and the Seven Dwarfs goes for 33 minutes, 15 seconds. It provides notes from Canemaker, Giaimo, film historians Paula Sigman, Russell Schroeder and Brian Sibley, composer Michael Giacchino, biographer Neal Gabler, production designer Ralph Eggleston, directors/writers Ron Clement and John Musker, Walt Disney Music president Chris Montan, and animators Eric Goldberg, Ward Kimball, Marc Davis, Ken Anderson, Woolie Reitherman, and Frank Thomas. “Making” presents a general overview of Disney’s interest in the Snow White story, development and challenges, and the film’s success. “Making” feels a little self-congratulatory at times, but it gives us a succinct overview of the project. With Bringing Snow White to Life, we find an 11-minute, 33-second piece with Canemaker, Sibley, Musker, Goldberg, Reitherman, Sigman, and animators Andreas Deja, Art Babbitt and Grim Natwick. This piece gives us a quick look at some of the artists who worked on the movie. It offers a good little synopsis on the animators. After this we get a Hyperion Studios Tour. It goes for 30 minutes, 36 seconds and features Ken Anderson, Frank Thomas, Marc Davis, Frank Thomas, Ward Kimball, Woolie Reitherman, Grim Natwick, sequence director Wilfred Jackson, art director Ken O’Connor, animators Milt Kahl, Blaine Gibson, Ollie Johnston, Robert Stokes, Eric Larson and Volus Jones, director David Hand, voice actor/ink and paint artist Marcellite Garner, ink and paint artists Lucy and Isabelle Wheaton, multiplane camera operator Eustace Lysett, camera operator Adrian Woolery, effects animator Edwin Parks, sound engineer James MacDonald, sound recordist Bob Cook, background artist Maurice Noble, gag man Roy Williams, story man’s wife Erna Englander, and live action reference performers Marge Champion and Don Brodie. We get a look around the Disney lot along with tons of anecdotes from those who worked there. This isn’t the most concise piece I’ve seen, but it comes with tons of great tales and insights. During Decoding the Exposure Sheet, we get a six-minute, 49-second program. In it, producer Don Hahn dissects the use of this document for the film. He gives us a succinct overview. Snow White Returns reveals “newly discovered storyboards”. During the eight-minute, 44-second clip, producer Don Hahn tells us about these story sketches. Hahn gives us some background for the art and then lets us see them along with his narration and other audio. This is a really cool addition to the package, as it’s fascinating to check out an abandoned short “sequel” to Snow White. Two Story Meetings follow. We see clips for “The Dwarfs” (5:51) and “The Huntsman” (3:55). In these, we hear vocal re-enactments of sessions used to develop their respective subjects. Both provide fun glimpses behind the scenes. Next we get two Deleted Scenes. These include “Soup Eating Sequence” (4:07) and “Bed Building Sequence” (6:28). Both present unfinished pencil animation, though “Soup” looks a lot closer to completion; much of “Bed” actually reverts to story reels. Both sequences offer fascinating glimpses of unused Snow White material and they’re valuable additions to the package. In the six-minute, 20-second Animation Voice Talent, we hear from Roy E. Disney, film historians Paula Sigman, Rudy Behlmer, and John Canemaker and also see some archival - but fairly modern - footage of animators Frank Thomas and Ollie Johnston and actress Adriana Caselotti. Overall, we get a quick discussion of how the actors got their parts and learn a smidgen about some of their careers. It should have been more detailed, but it’s an interesting introduction nonetheless. The disc opens with ads for Zootopia and The Good Dinosaur. Sneak Peeks adds promos for Disney Parks and Disney Stores. No trailer for Snow White appears here. A second disc provides a DVD copy of Snow White. It includes two deleted scenes but lacks any of the other extras. Note that the 2016 Blu-ray drops many components from the original 2009 release – and that one omitted materials from the original 2001 DVD. I don’t understand Disney’s tendency to lose extras from earlier releases, but that trend persists here. Disney’s wonderful legacy of animated features began with Snow White and the Seven Dwarfs, and it did so in fine style. The movie deserves attention for reasons above and beyond its seminal status, as it provides an entertaining and warm experience accompanied by excellent animation and artwork. The Blu-ray provides absolutely excellent picture quality as well as very solid sound for its era and a collection of mostly interesting supplements. On its own, this 2016 “Signature Collection” Blu-ray is a nice piece of work. However, fans who already own the 2009 Blu-ray won’t need to get it, as it offers the same picture/audio and gives us no new bonus materials worth the price of re-admission. If you don’t own any Snow White Blu-ray, I’d recommend the out of print 2009 version – if you can find it. If not, the 2016 Blu-ray acts as a perfectly acceptable second choice.